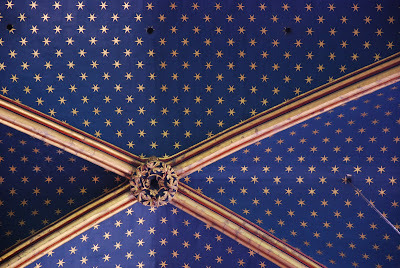 After visiting Sainte-Chapelle, I start wondering why all these churches seem to have blue ceilings with yellow stars. Furthermore, I have noticed this in other churches in Paris as well as the Duomo of Siena, Italy which was built at the same time as Sainte-Chapelle. Also, the ceiling of the Sistine Chapel originally was "nothing more than a blue pincushion sky full of golden stars" before Michaelangelo painted over them (and the rest, they say, is history). St. Patrick's Pro-cathedral in Newark, NJ, built in the 1850s, also has a similar ceiling "representing the vault of heaven" which is a too-obvious and very boring explanation. The only remaining indication of the original intention of the chapel are the painted yellow stars against a blue background on its vaulted ceiling, symbols of Saint Mary in Catholic tradition. So why is a blue sky with yellow stars a symbol of Mary? I don't know. As an interesting alteration on this standard ceiling, the lower chapel in Sainte Chapelle also has a blue ceilinng adorned with yellow figures but the stars are replaced with fleur-de-lis. In fact, fleur-de-lis are imprinted on just about everything in the lower chapel. The explanation appears to be that the lower chapel was dedicated to the Virgin Mary and the fleur-de-lis (literally "lily flower") is used as a symbol or metaphor for Mary, especially during the 13th century when the chapel was built. PS The blue background with yellow stars is also the scheme for the European Union flag, although there doesn't appear to be any direct connection with the ecclesiastical symbolism. Still seems a little too coincidental to me. Thanks for this post. I was trying to recall what cathedral I had visited that had yellow stars against a blue backdrop. It was the duomo in Siena. Absolutely gorgeous though from the ground, one can barely tell they are stars way up there. Fitting, I think. Mary is associated with the stars because of a line from the Book of Revelation, where it talks about a woman who is crowned with stars. That being said, the churches are often built to remind the faithful of their final goal: heaven. The churches are meant to serve as a visual bridge between earth and heaven. And, so... the stars are painted on the ceiling as a reminder of heaven. No...it is because the tilma worn by Our Lady of Guadaluape. It is the pattern on her tilma. Our Lady of Guadalupe did not appear until the 16th century. Blue ceilings and stars predate that going back centuries.